After over 50 years of operation, NASA is about to permanently enter the world of instant (or near instant) information exchange with the general public in a new way that largely symbolizes one of the changing ways the premiere US space agency will interact with the public and disseminate information about science operations and real-time orbital operations on the International Space Station. While NASA already has a fairly good track record of releasing operational and scientific data sets from its various missions, the decision has been made to proceed to the next step and take the ISS into the live data streaming environment of the 21st century through webpage and mobile device app browsing. The change, however, is not just a change in the live streaming of information between the ISS and MCC (Mission Control Center) Houston and Moscow. It is also a change in how NASA shares real-time data with the public at large. This means that household and personal computing and communication devices can now access the streamable information from the International Space Station and MCC Houston. But that ability will require an increase in the need for “Mobile Device usage” including computers with internet connection, smart phones, tablets, and the creation of new apps for some of these devices to link up with the soon-to-be up-and-running ISS Live program. The Open Government initiative for NASA and the International Space Station, which had its US core segment designated a US National Lab in the last couple of years, has kick started a Mission Operations Directorate plan call the Public Data Services Initiative. 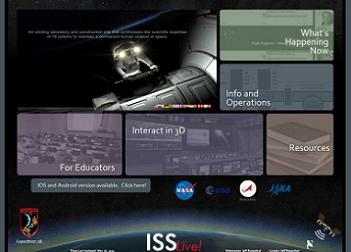 At its core, the ISSLive! 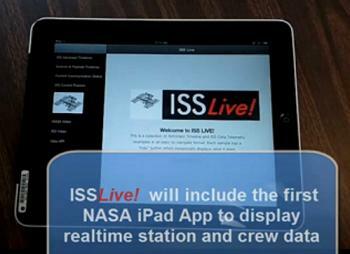 mobile application (which will be available over the internet and for purchase in app stores for various smart phone and tablet devices) will provide users with “simplified” console information readouts on public telemetry and timeline data for the International Space Station as well as current live tracking ability of the International Space Station, ISS MCC Houston “over the shoulder” viewing opportunities, ISS crew timelines (broken up into daily increments), MCC console displays, and Acquisition of Signal (AOS) and Loss of Signal (LOS) indicators/predictors. “Aggressive schedule for development. Must focus on ISSLive! Core Concept” which includes “public telemetry and timeline data, education review of technical content, export control for technical content, approvals for space organization icons and flight controller icons/patches, and above all ISSLive! Team and Product integration,” notes the ISSLive! presentation. Specifically, the public telemetry and timeline data will use a “LightStreamer Server (Port 80) and a public API for telemetry.” A timeline XML is currently under evaluation. Web pages will also be used, as will HTML content as part of this new data streaming initiative. For this new application, considerations to sensitive and restricted information had to be taken into account, as well as larger issues of the Open Government initiative with respect to Human Spaceflight on the ISS. Specifically, ITAR requirements have to be met to ensure the protection of restricted technology data – a holdover from the Cold War Rocket and Tech Protection programs. Furthermore, crew privacy and proprietary information concerns had to be addressed and reviewed to make sure that ISS crews’ rights to privacy would be maintained throughout the program. Lastly, agreements and approvals for this application had to be gained from the International Space Station partner family. In order to ensure a timely and smooth rollout of the ISSLive! application, a demo for stakeholders was rolled out on August 31 via the web browser Firefox (as bugs were still being worked out on other browsers) to review the telemetry and timeline part of the app. Input from those involved was solicited to identify any issues with information accuracy. 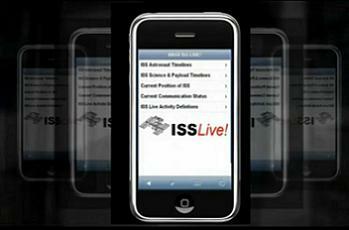 “Need everyone to provide feedback on content accuracy for all wording and parameters,” noted the ISSLive! Demo presentation – also available for download on L2. The demo lasted from August 31 to September 7, 2011. After this, a thorough review was initiated with a target rollout date for the application of Oct. 1, 2011 – the start of the new fiscal year for the US government. Based on the review, a prioritized list of work to be completed by Oct. 1 was created. 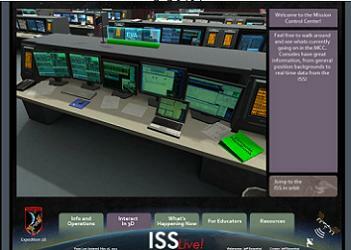 The list included the following: working links between Link/Navigation; proper rendering of all pages; preventing a freeze on the active console on 3D Unity view; making sure that Station rendered properly and completely; ensuring proper connection of ISS model to real-time tracking and orientation data; ensuring proper telemetry readouts. It is hoped the application will be available as of Tuesday of this week. (Images via NASA and L2 content).